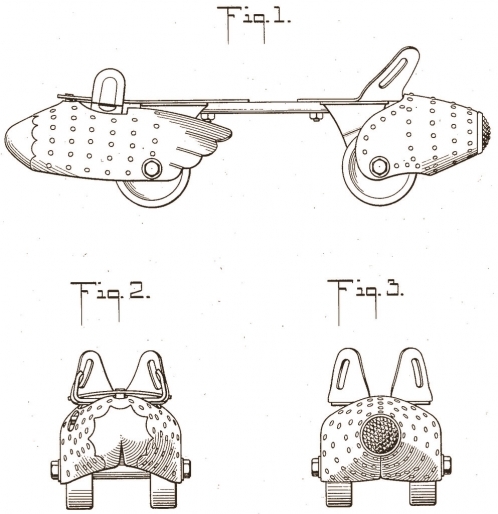 The patent for these Louis Marx roller skates was issued in 1935. 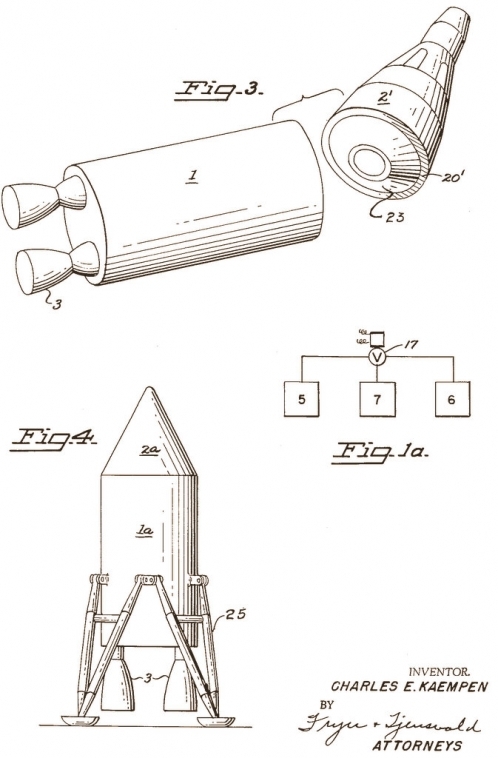 Invented by Charles E. Kaempen, this "Space Rendezvous Apparatus" was awarded a patent in 1966. This invention relates to an apparatus and method for effecting a space rendezvous and more particularly relates to an in-transit or linear rendezvous mode of space transport employing trajectory operations conducted by two or more individually launched space units adapted to rendezvous in-transit for assembly into a single space craft. 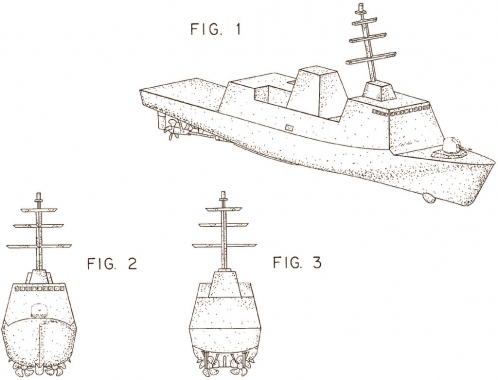 The patent for this corvette was assigned to Ingalls Shipbuilding in 2006. A corvette is smaller than a destroyer, fast and frequently used for anti-submarine operations. 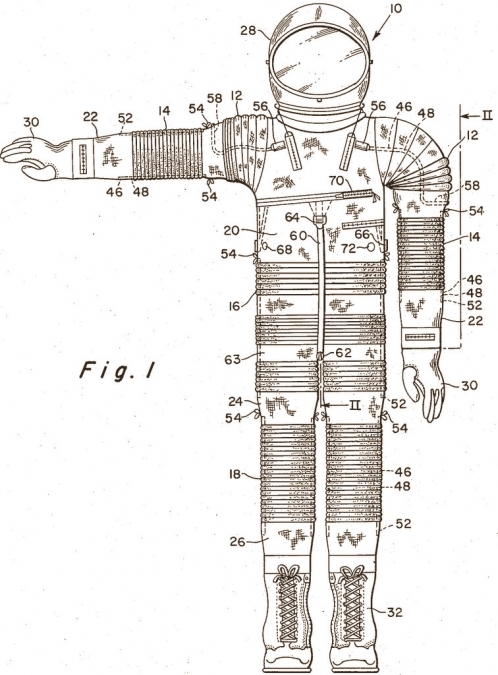 Randall F. White and George J. Scott were awarded a patent in 1961 for this Full Pressure Flight Suit. The patent was assigned to the Secretary of the Navy. One of the well-known hazards in high altitude aircraft and space flights is the rapid reduction of pressure on the body surface of the occupants with increasing altitude. A partial solution to this problem has been the development of pressurized cabins and cockpits. 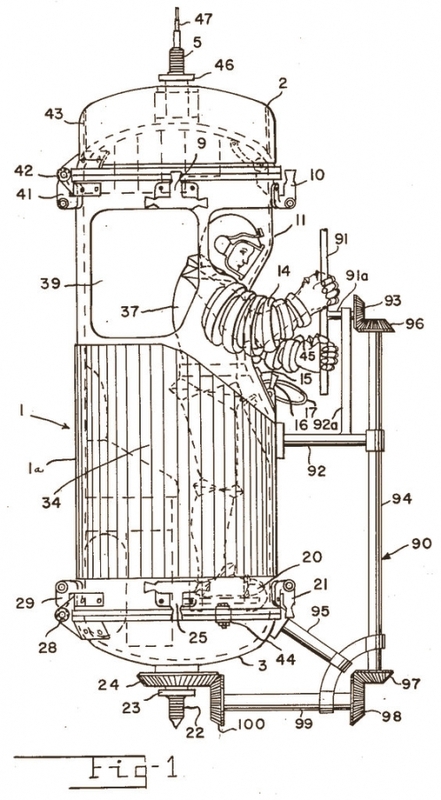 However, since pressure can be lost by accidental blowout or puncturing of the cabin, or should the pilot be forced to bail out, the need for individual pressure flight suit protection has been long recognized. . . The present invention comprises a suit of flexible material having a plurality of spaced nonconvoluted tubular sections joined by a plurality of convoluted tubular sections at the principal joints of the occupant, such as the shoulders, elbows, waist, and knees. Each of the smaller diameter folds of the convoluted sections has a nylon cord secured around the periphery thereof to restrain any ballooning effect of the section when the suit is subjected to internal pressure. Inventor Otto Schueller was awarded a patent for this Multi-Purpose Space Capsule in 1963. 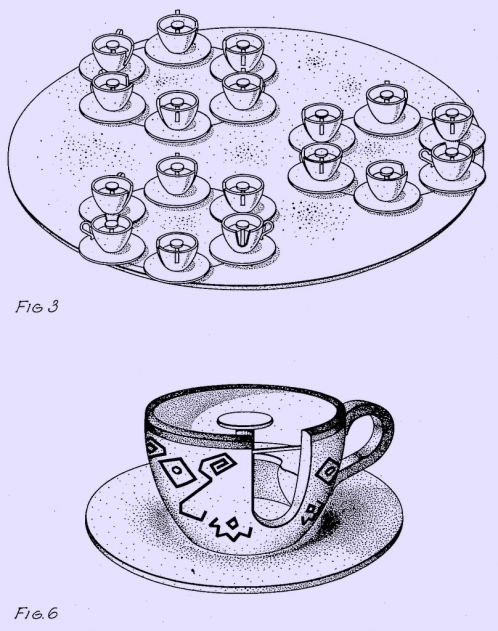 Described as a "Passenger Carrying Amusement Device," this patent for Disney's tea cup ride was issued in 1957. Walter E. Disney, Los Angeles, Calif., assignor to Disneyland, Inc., Anaheim, Calif., a corporation of California. 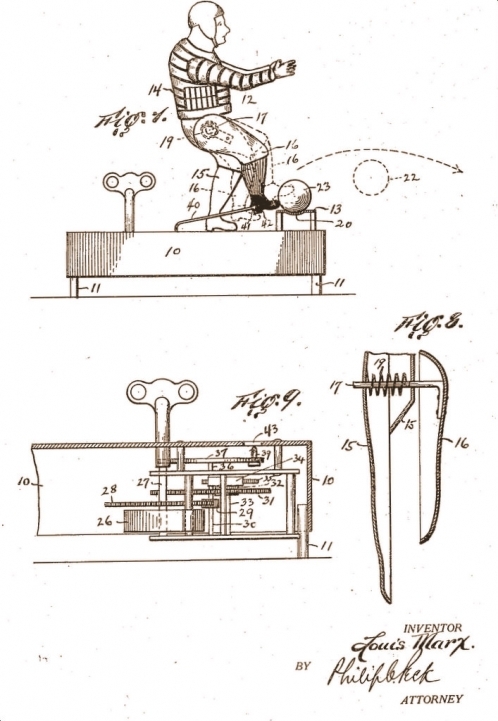 A patent was issued to Louis Marx in 1924 for this mechanical toy football player, which kicks balls queued up at the end of the platform. My invention relates to that type of mechanically operated toys in which means are employed for imparting movements to various members in the figures supported on a platform or standard containing the motor mechanisms, and the object of my present invention is, among other things, to provide an improved toy of this class in which a spring-impelled member of a toy human figure is intermittently retracted against the tension of the spring by a motor mechanism, and thereafter suddenly released at a certain point in the normal operation of such motor mechanism. In the present embodiment the figure of a football player is positioned upon a platform in which a hinged leg is normally forwardly impelled by a spring coiled at the hip joint in combination with a spring motor to withdraw such leg against the coil spring and thereafter release such leg when withdrawn to the limit, which is quickly swung forwardly by the spring to kick a ball arranged in the arc of movement of the foot at the end of the toy ... My improved toy also embodies an inclined run-way mounted on the platform for automatically feeding a plurality of balls to be successively struck from the "kick-off" position in the normal operation of the toy. 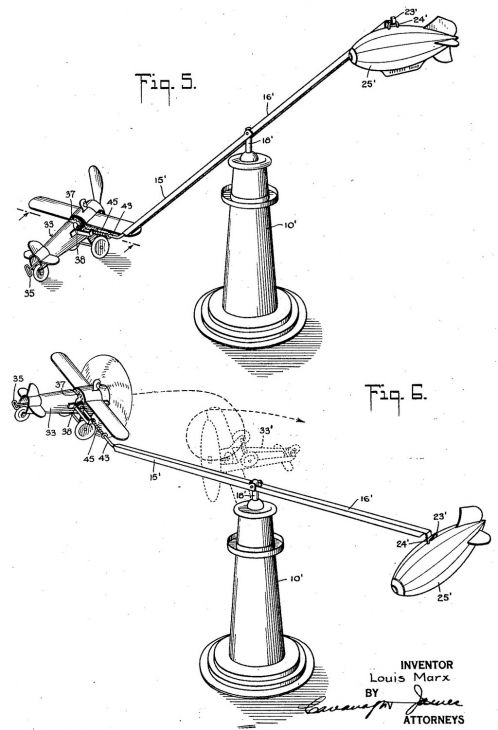 This patent design for a toy airplane that will perform stunts was assigned to the Louis Marx toy company in 1926. 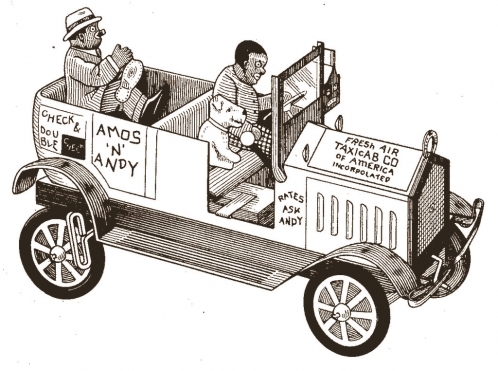 This toy Amos 'n' Andy taxi cab was designed for sale by the Louis Marx toy company in 1930. "Check & Double Check. Fresh Air Taxicab Co. of America Incorpolated. Rates ask Andy." Learn more about Amos 'n' Andy. You can see a photo of the actual toy here. 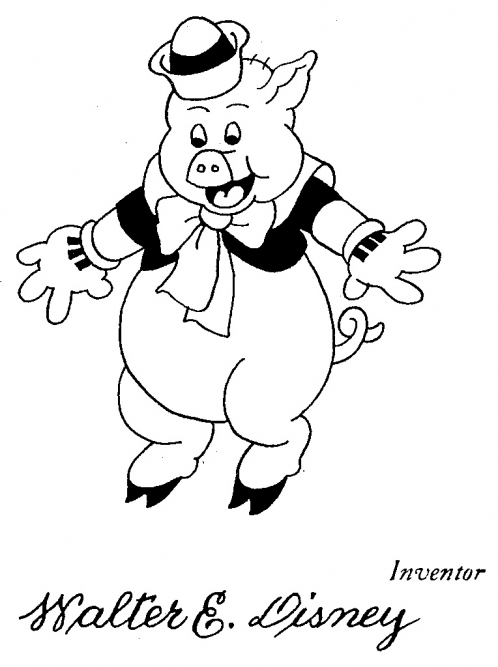 A design patent was issued to Walt Disney in 1934 for this drawing of a pig. The pig is one of the characters in the Disney animated short film Three Little Pigs. Be it known that I, Walter E. Disney, a citizen of the United States, residing at Los Angeles, in the county of Los Angeles and State of California, have invented a new, original, and ornamental Design for an Animal Figure or Similar Article, of which the following is a specification, reference being had to the accompanying drawing form a part thereof.